Head of the Al-Hikma National Movement, Sayyid Ammar al-Hakim, in his office in Baghdad met with Speaker of the Council of Representatives, Mr. Mohamed al-Halbousi Tuesday 17/9/2018 His eminence stressed the need to pass the important laws and keep the Council of Representatives away from political disputes, and the importance of prioritizing public interests and pass laws that directly concern the interest of citizens that complement the body of the political system in Iraq. His eminence congratulated the Council of Representatives for electing the Presidency Authority considered it a first step to complete constitutional entitlements and form a government. His eminence stressed the importance of forming a strong and serving government capable of achieving the aspirations of the Iraqi people, and the importance of integration between legislative, executive and judicial authorities, called for the need to work on restoring confidence in the Council of Representatives and reduce unnecessary privileges. 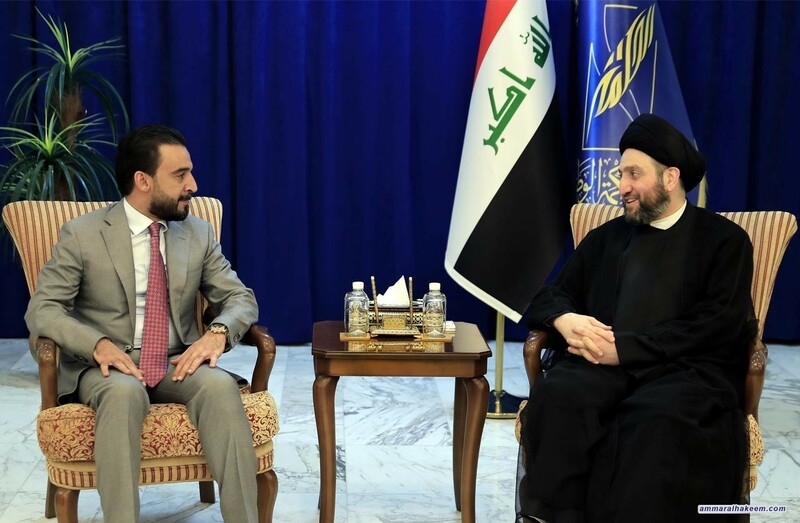 His eminence stressed on the need for balance and neutrality and exclude Iraq from the policy of axes, called for producing the Iraqi decision in accordance with the Iraqi interest, adding the importance of communication with everyone and making Iraq a bridge of communication among adversaries not an arena for their conflicts.